We are entering the home stretch of the 2015 Back to School Giveaway at On Time Supplies. With a $2,100 Prize Package, this is the biggest giveaway in the history of On Time Supplies. Part of what makes year’s giveaway so special are the awesome prizes from 3M. 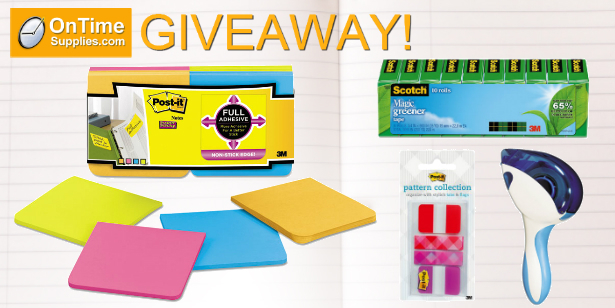 Win $300+ in Scotch & Post-it Desk Supplies! The more you enter, the more chances to win! Join our email list for the latest school & office supply deals. Subscribe to the Office Ink Blog. Follow us & share the giveaway on Facebook, Google+ AND/OR Twitter. Leave a comment on this post telling us about your favorite teacher or student. Be sure to mention where you shared the Giveaway so we can count your entry. Remember, you get one entry for each place you subscribe and share. So if you’ve already joined our email list, subscribe to the blog to increase your chances! After that, you get on entry when share the giveaway on Facebook, Google+ or Twitter. Subscribe and share everywhere for up to five chances to win. Don’t forget to leave a comment for every entry so we can be sure to count them all! Hurry! The Back to School Giveaway ends Friday, August 21, 2015. Don’t miss your chance to win 3M supplies and more in the $2,100 school supplies prize package! As a teacher with limited funds, this would be amazing to share with my students.